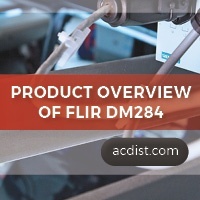 The FLIR DM284 is a truly reliable measurement and diagnostic tool that performs brilliantly both as an RMS digital multimeter as well as a thermal imager. Knowing about the nature of the problem in today’s complicated circuitry isn’t enough. Any DMM, or even an analogue multimeter, can detect voltages, currents, etc. and report it to the user. The problem kicks in when locating the precise location of an electric problem is required so that minimum downtime will be suffered due to the circuitry. All objects have a temperature and can be differentiated against a cooler or hotter background. For engineers, a quality thermal camera can significantly make day-to-day tasks easier. The camera essentially becomes a "third eye", seeing where the natural eyes cannot. 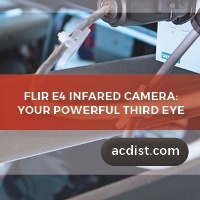 The FLIR E4 infrared camera is an example of this useful device. The FLIR C-Series are a set of portable, full-featured, thermal cameras for use in thermal inspection of buildings, electrical/electronic, and mechanical systems. They are excellent non-destructive tools for fault location and verification of the repairs performed. You can carry them in your pocket so that you are ready to find hidden plumbing blockages, HVAC issues, structural defects, hotspots, and various other problems. The MSX system allows real time superposition of optical image over the IR picture for identification of faulty components.